From the back cover: "A twenty-year-old barrel of genuine Pennsylvania Dutch sauerkraut isn't Magdalena Yoder's idea of a great wedding present from her future father-in-law. Especially when it has a corpse in it. And it sure puts Memmonite-born Magdalena, owner of the picturesque PennDutch Inn, in a pickle. 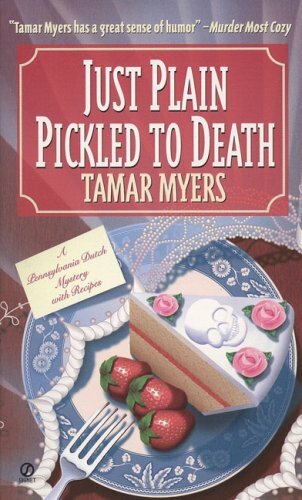 She has just one week before she ties the knot with the man of her dreams - and this bride of forty-four will allow nothing to delay her nuptials, even murder...."
This was another hillarious mystery with lots of laugh out loud parts in it. I enjoyed it thoroughly.